Artificial intelligence is invading many fields, most recently astronomy and the search for intelligent life in the universe, or SETI. Researchers at Breakthrough Listen, a SETI project led by the University of California, Berkeley, have now used machine learning to discover 72 new fast radio bursts from a mysterious source some 3 billion light years from Earth. Fast radio bursts are bright pulses of radio emission mere milliseconds in duration, thought to originate from distant galaxies. The source of these emissions is still unclear, however. Theories range from highly magnetized neutron stars blasted by gas streams from a nearby supermassive black hole, to suggestions that the burst properties are consistent with signatures of technology developed by an advanced civilization. "This work is exciting not just because it helps us understand the dynamic behavior of fast radio bursts in more detail, but also because of the promise it shows for using machine learning to detect signals missed by classical algorithms," said Andrew Siemion, director of the Berkeley SETI Research Center and principal investigator for Breakthrough Listen, the initiative to find signs of intelligent life in the universe. 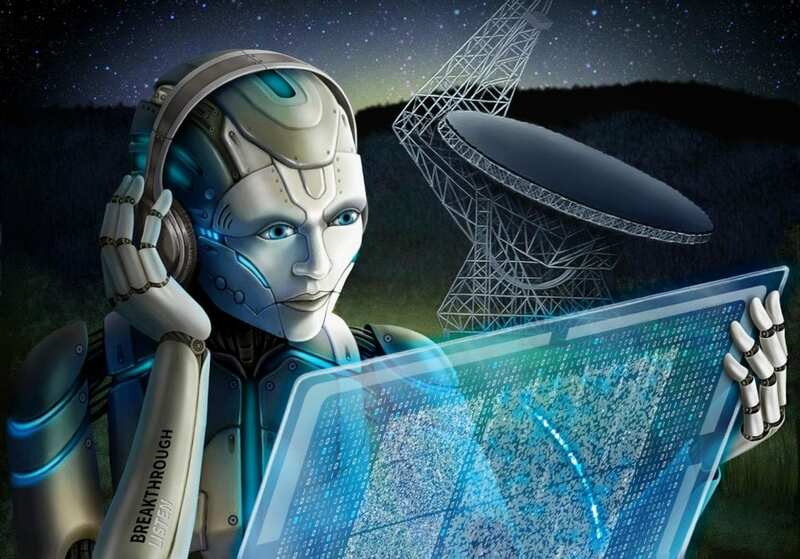 Breakthrough Listen is also applying the successful machine-learning algorithm to find new kinds of signals that could be coming from extraterrestrial civilizations. While most fast radio bursts are one-offs, the source here, FRB 121102, is unique in emitting repeated bursts. This behavior has drawn the attention of many astronomers hoping to pin down the cause and the extreme physics involved in fast radio bursts. The AI algorithms dredged up the radio signals from data were recorded over a five-hour period on Aug. 26, 2017, by the Green Bank Telescope in West Virginia. An earlier analysis of the 400 terabytes of data employed standard computer algorithms to identify 21 bursts during that period. All were seen within one hour, suggesting that the source alternates between periods of quiescence and frenzied activity, said Berkeley SETI postdoctoral researcher Vishal Gajjar. UC Berkeley Ph.D. student Gerry Zhang and collaborators subsequently developed a new, powerful machine-learning algorithm and reanalyzed the 2017 data, finding an additional 72 bursts not detected originally. This brings the total number of detected bursts from FRB 121102 to around 300 since it was discovered in 2012. "This work is only the beginning of using these powerful methods to find radio transients," said Zhang. "We hope our success may inspire other serious endeavors in applying machine learning to radio astronomy." Zhang's team used some of the same techniques that internet technology companies use to optimize search results and classify images. They trained an algorithm known as a convolutional neural network to recognize bursts found by the classical search method used by Gajjar and collaborators, and then set it loose on the dataset to find bursts that the classical approach missed. The results have helped put new constraints on the periodicity of the pulses from FRB 121102, suggesting that the pulses are not received with a regular pattern, at least if the period of that pattern is longer than about 10 milliseconds. Just as the patterns of pulses from pulsars have helped astronomers constrain computer models of the extreme physical conditions in such objects, the new measurements of FRBs will help figure out what powers these enigmatic sources, Siemion said. "Whether or not FRBs themselves eventually turn out to be signatures of extraterrestrial technology, Breakthrough Listen is helping to push the frontiers of a new and rapidly growing area of our understanding of the Universe around us," he added. The new results are described in an article accepted for publication in The Astrophysical Journal and available for download from the Breakthrough Listen website.